Sure, lots of money might be nice. But an even better way to relax about your financial situation is to buy into a new way of thinking, one you can bank on. If you&apos;re worrying about making ends meet—obsessing and even waking up panicked in the night—you&apos;re not the only one, not by a long shot. Half of Americans say their tension level is higher now than it was five years ago, with three-quarters listing money and work as the leading causes, according to a recent survey by the American Psychological Association. There&apos;s just one smart thing to do when you&apos;ve got economic troubles, says Ted Klontz, PhD, coauthor of Mind Over Money (Broadway Books). Treat them as an opportunity. "Instead of stressing, think of a tight money spot as the equivalent of a heart attack that makes you quit smoking, and start eating better and exercising," he says. "It usually takes something that dramatic to make us try new behaviors." Logic might say that the sure cure is more cash, and plenty of it. But real peace of mind, the kind that outlasts life's many ups and downs, doesn't depend solely on your personal bottom line. "The people who feel the best about money aren't the ones who have a lot of it," says clinical psychologist Maria Nemeth, PhD, author of The Energy of Money (Wellspring/Ballantine). "What they do possess is a knowledge of how to earn and spend that reflects their deepest values." While there are countless factors beyond your control, a few simple changes will allow you to have power over your outlook and attitude. And that's priceless. Feelings about earning and spending are usually rooted in childhood, which is why it's helpful to think about how you were raised. Maybe your parents conducted business privately, so for all you knew, bills were paid by magic. Or perhaps they were nervous scrimpers, conveying that financial matters were inherently scary. "Once you look at your parents' influence, you can choose which of their habits and attitudes you want to save and which you should discard," says Susan McCarthy, PhD, author of The Value of Money (Tarcher). "It's about being very conscious so you end up using your resources exactly the way you want to." What are your regrets? Committing to five years of car payments when the old vehicle would have run another 50,000 miles? Cashing in the 401(k) instead of rolling it over? Using plastic for that birthday getaway weekend? List them, own them, learn from them, and then let them go. Continuing to mull over missteps only bogs you down. "Improving a relationship, whether it's with your spouse or your finances, always begins with rigorous honesty," says Paula Langguth Ryan, author of Bounce Back from Bankruptcy (Pellingham Casper Communications). This step sounds counterintuitive, but it works. Play out in your mind all the things that could go wrong. Then picture yourself dealing with them, being very specific. 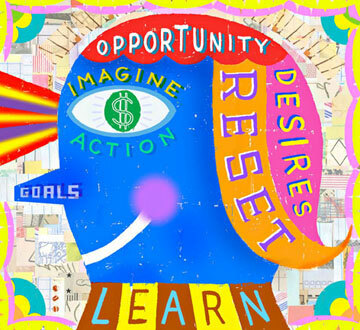 "Imagining a worst-case scenario can help us tap into resources and creativity we didn't know we had," says Jonathan Alpert, LPC, a psychotherapist in New York City. "People often underestimate their ability to deal with a crisis." Mentally going over how you'd cope is a kind of rehearsal that builds inner strength. Yes, we know. What you'd really like is a winning lottery ticket. But would that truly do it for you? Research shows that people who have won millions typically return to about the same levels of contentment they had before their big score. Instead of dwelling on the what-ifs, consider your sources of deepest satisfaction—providing for your kids, helping the community, having a little fun. Even without megabucks, you can take care of these needs. On an index card write down five things you hope to achieve in the next 12 months and put it in your wallet. Next time you're tempted to spend impulsively, pull out your list and ask yourself, "Can this purchase wait?" or "Is there a less expensive way to do this?" Slowing down spending and focusing on the long-term gain creates clarity. Then you'll be well on your way to having your dreams come true. Choose a task you've been putting off: Send for your credit report and start cleaning up any mistakes, make an appointment with a lawyer about creating a will, or start drafting a master list of your assets so the information will be in one place. 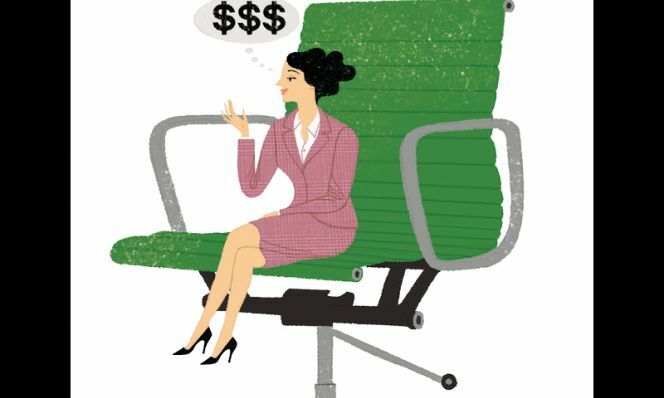 The payoff of taking control, even a little at a time, can be huge: "Bring some ease into your relationship with money," says Nemeth, "and you'll see the serenity spreading to all areas of your life." Kristin Roach, a San Antonio mother of two, has discovered a simple way to achieve economic security. Despite a lean budget, she's paid off $80,000 in debt in the last 10 years, leaving just her mortgage still to go. Consumer credit counseling helped, as did finding new ways to live more frugally. But her real secret weapon was the decision to be grateful for every part of her financial life—even her bills. (Don't laugh until you've tried it.) "Every time I make a payment, I give thanks that I can take care of our needs," says Kristin, a professional musician. Kristin also contributes regularly to charity. "Donating reminds me how fortunate I am," she says. So far, so good. And when you add in generous thinking about others' achievements, says Ellie Kay, author of Living Rich for Less (WaterBrook), you've got a powerful formula. "It's easy to let someone else's success make us feel poorer," she says. "But if we wish good fortune for everyone, we give up envy." And that clears the way to see how much we have in our own lives. Ready to try something a little crazy? Take a cash sabbatical. "Handling finances triggers primal emotions like fear and greed, and those feelings make it hard to get perspective," says Brent Kessel, author of It's Not About the Money (HarperOne). "So from time to time arrange a day when you don't buy anything at all. As you watch your desires rise without satisfying them and ride out the discomfort, the urges typically subside." When the compulsion passes, you'll have a deeper sense of calm and more patience. From there, you'll be better equipped to make spending decisions that will have longer-lasting benefits. You've got incredible economic assets living right under your roof: your children. "To begin with, stop trying to hide your situation," says clinical psychologist Maria Nemeth. "Kids sense your tension, and if they don't hear an explanation, they'll imagine the worst." Give them an overview (including your plans for fixing the problem), ask for ideas, then sit back and listen. "In a crisis children want to know two things—whether their parents are going to be okay, and what they can do to help," says Nemeth. She had one client who told her 11-year-old she could pay for his karate lessons, but not for his uniform. The boy happily mowed lawns and washed cars to get the money. Another mom took her kids up on the idea of preparing more meals from scratch, and now the family cooks together several times a week. A teen in a different family suggested that instead of taking an expensive theme park trip, everyone go to the beach instead. They saved big and had just as much fun. Your children may have other ideas. The thing is, most kids really want to pitch in, and when they do, everybody wins. Originally published in the November 1, 2010, issue of Family Circle magazine.